When a firmware update is available for your Wemo® device, the Wemo App will automatically prompt you for a firmware upgrade. 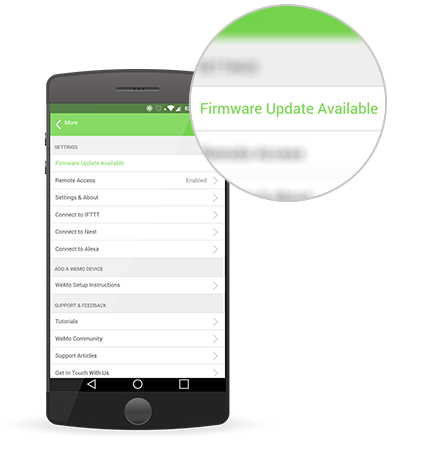 It is important that you update the firmware of your Wemo device to ensure proper functionality. Your Wemo device should be powered ON. Your Wemo device and the mobile device where your Wemo App is installed should be connected to the internet. Your Wemo App is on the latest version. 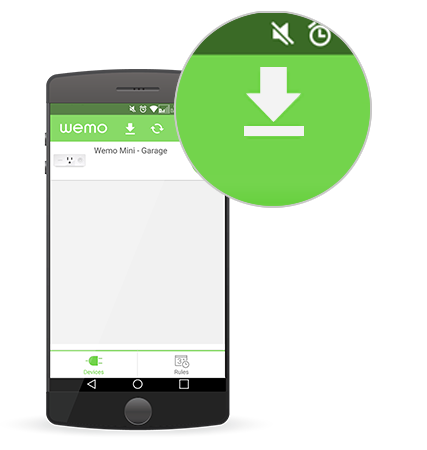 Download the latest version of the Wemo App from Google Play™ or the App Store®. IMPORTANT: Updating the Wemo devices remotely is not available on devices with firmware version below 2.00.1821. You may check the Wemo App if it did not prompt for a firmware update. Step 1: On your mobile device, tap . Step 2: Tap the Download icon above the Devices list section. Once a pop-up message appears to confirm the download, tap Yes. Alternatively, you can tap the gear icon and see the new Firmware Update Available section. Tap on this to read the release notes and accept the update. NOTE: If you are using an iOS device, you need to tap More then Firmware Update Available. QUICK TIP: If there is no option to update such as the Download link or the Firmware Update Available field, uninstall and reinstall the Wemo App while your mobile device is on the same Wi-Fi as your Wemo device. Step 3: When the firmware is available, proceed with the update process. For instructions, click here. The Wemo app will download the updated firmware before it starts to upgrade. This is done to make sure that the file is correct and the Wemo device will not be damaged. If your Wemo device is unable to download the update, try positioning it closer to your router first to avoid interference. When the firmware is available, update your Wemo device. For instructions, click here. IMPORTANT: While updating your firmware, make sure to stop any activity that consumes the bandwidth such as streaming and downloading. If you are still having issues, the update server may be busy or down. You may try updating the firmware at a later time. Step 1: Close the Wemo App completely. Make sure it isn't running in the background. For instructions, click here. Step 2: Unplug the upgraded Wemo devices. Step 4: The Wemo App will notify you if a firmware update is available. Tap Yes to proceed. QUICK TIP: If you miss the pop-up, you may download the firmware by clicking the Download icon above the Devices list section. A pop-up message will appear to confirm the download, tap Yes. Also, you can tap the gear icon and see the new section Firmware Update Available. Tap on this to read the release notes and accept the update. QUICK TIP: If there is no option to update such as the download link or the Firmware Update Available field, uninstall and reinstall the Wemo App while your device is on the same Wi-Fi as your Wemo device. Step 5: When the firmware is available, proceed with the update process. For instructions, click here. Move your Wemo device closer to your router to minimize interference and interruptions. Force close the Wemo App, then clear its cache and data on your mobile device's Settings. If this doesn't fix the issues, reinstall the Wemo App then reboot your mobile device. You'll retain your saved Rules when you reconnect the Wemo App in the same Wi-Fi as your Wemo device/s. Powercycle your devices, starting with your Wi-Fi router then the affected Wemo device/s. For iOS devices, try updating your Wemo device's firmware using a device with the latest iOS version.